We drove four miles south of Cape Meares to our final stop of the day. Netarts Bay is supposed to be good for birds, but the tide wasn’t out yet, so there wasn’t a lot of bird life around. We drove the length of the bay and back, then pulled into a restaurant parking lot to get something to drink before heading back to Portland. 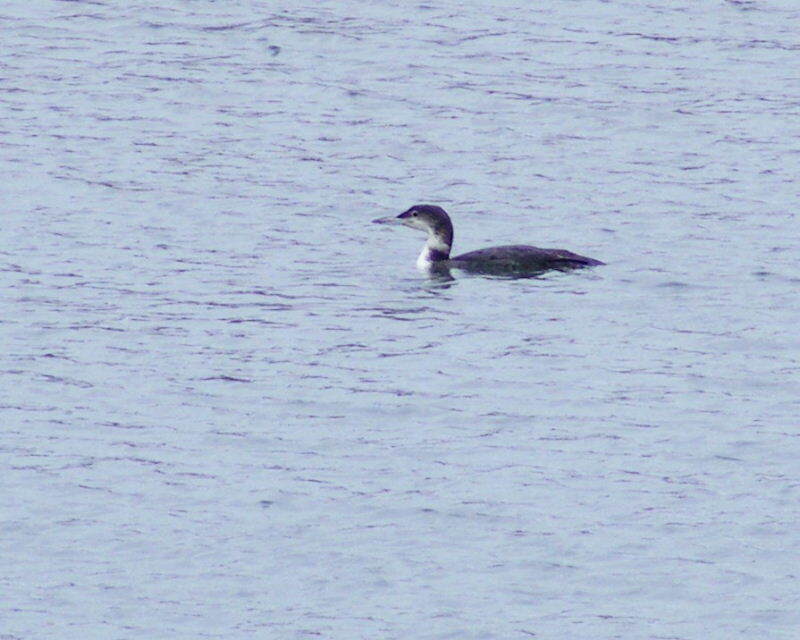 A Common Loon, still in winter plumage, was swimming about the harbor (right). When we first drove through town, I’d seen what I took to be a large log on the sand bar across the bay. Just before we got in the car to head home, I took one last scan with my spotting scope. 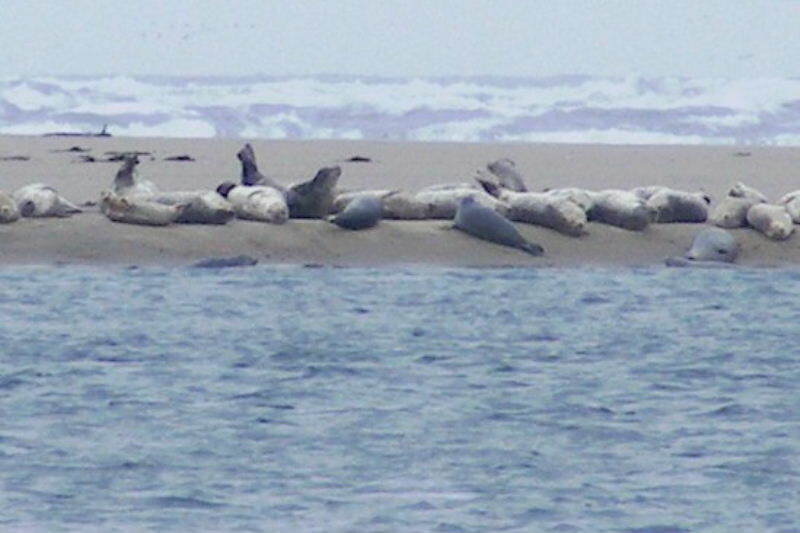 The “log” turned out to be a herd of Harbor Seals hauled out on shore. Earlier in the day, at Barview Jetty Park, I saw a swimmng Harbor Seal. It looked like a dog swimming across the bay, and it wasn’t until it had dived that I figured out what it was. I decided not to count it at that time. 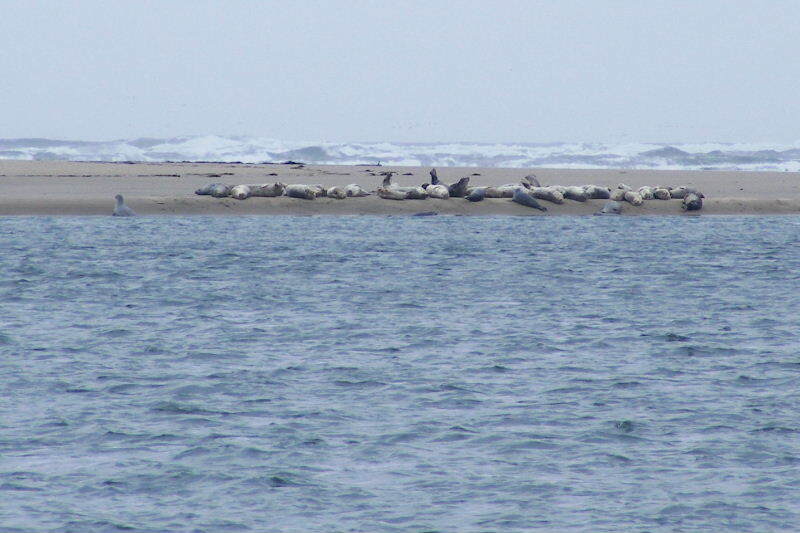 In Netarts Bay, we saw about 30 seals lined up on the shore at the water’s edge. Another two or three waddled out as we watched. A few of them were in the “banana” posture, with head and hind flippers raised. We watched for maybe five minutes. Here’s a close-up of the same picture.